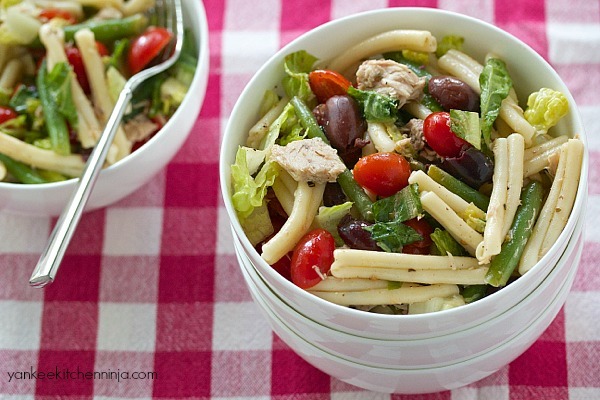 I'm also a huge fan of the tuna packed in oil that's a big part of this pasta salad nicoise. It's not as dry as tuna packed in water can often be, and it falls apart nicely (but not too much) when stirred into the salad. Added bonus? Because this is a cold salad (that also gets more flavorful the longer its ingredients mingle), it's perfectly transportable for BBQs, potlucks, picnics, concerts ... or even just brown-bag lunch leftovers. 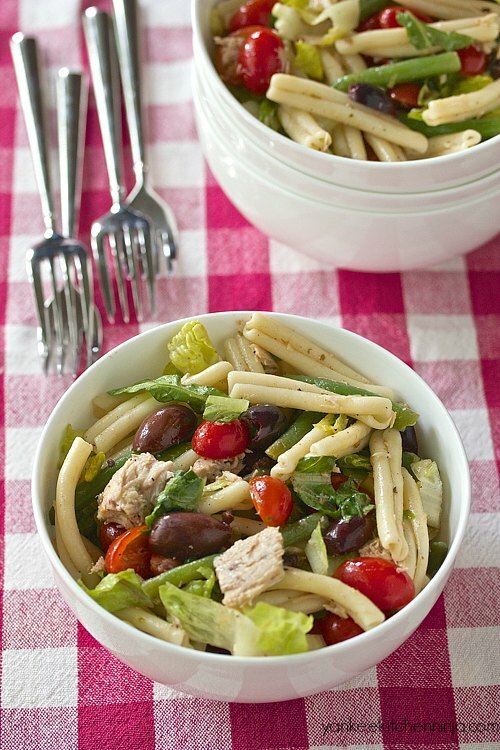 If the heat is leaving you feeling uncomposed, check the notion of a fancy composed salad at the door and instead enjoy this decidedly more simplistic pasta salad nicoise. Fan of salad nicoise: yay or nay? Leave a comment: The Ninj wants to know. Cook pasta according to package directions, adding the green beans to the pasta water for the last 2 minutes of cook time. Drain and rinse with cold water to cool slightly. While the pasta cooks, whisk the oil, lemon juice, salt and pepper into a dressing in a large salad bowl. Toss in the tomatoes, oregano and olives and let the mixture stand while the pasta finishes cooking. 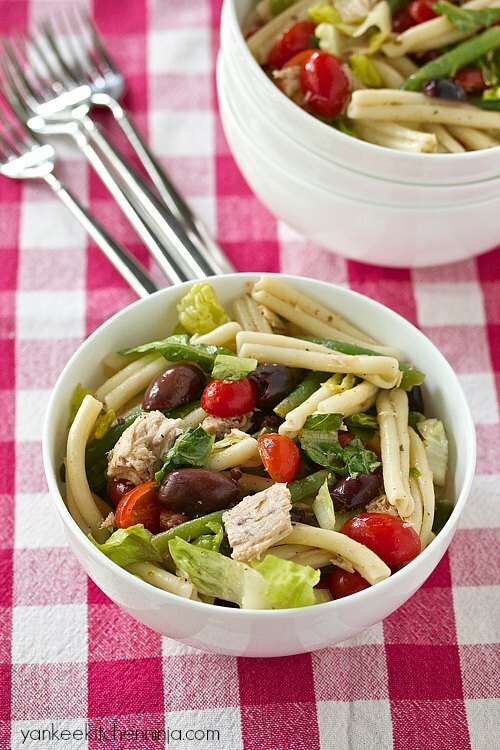 Add the rinsed pasta, lettuce and tuna to the bowl and toss everything gently to coat. Yes! This is such a great, classic flavor combination. I'd make a big batch of this on the weekend and eat it for quick lunches all week. That's EXACTLY what I do with it, Eileen! HA HA! You could omit it or use canned chicken, I suppose, Jeff.